Now that your car has a new exhaust system on it, you are still itching to get more power and a more aggressive sound. 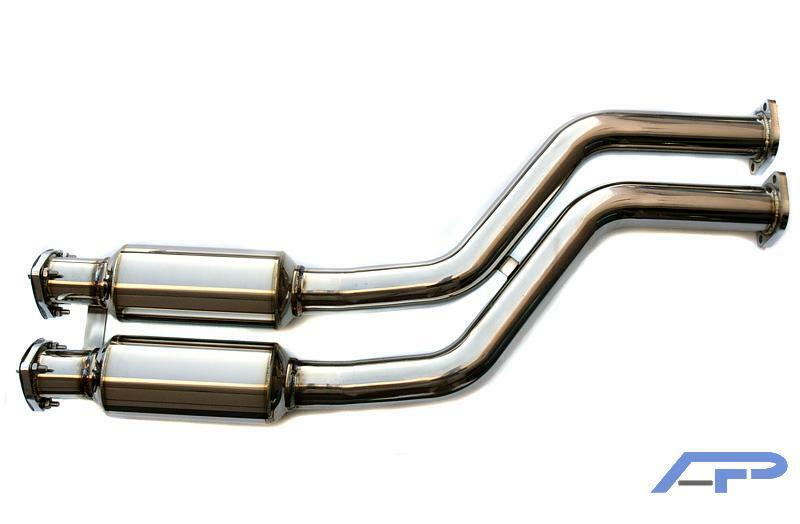 Well Agency Power has developed these CAt Delete pipes to give you a complete header back race exhaust system. The all T304 stainless steel pipes feature TIG welding, thick flanges, 02 Bungs, gaskets, and a complete polished finish. The OEM replacement pipes delete both the catalytic converters as well as the center resonators for a full race system. Note: This product is for off-road use only and requires tuning to maximize performance. Out of all the websites I've used to find my item, this was the lowest cost, and I'm so happy that I found them! Keep up the great work guys! Ordered on a Thursday evening and received my parts on Tuesday. Very quick but the website couldn't provide proper tracking info. Had the product I wanted and at the lowest price. Thank you for the outstanding service! Great price and really fast shipping. Great communication as well. This company offers profesional service at a very competitive price. The header collectors i ordered were not available at the big speed outlets. The fast shipping was also a plus. I would recomend Autoplicity to anyone who needs parts in a hurry ! They have great prices! The same item I purchased from autoplicity is on summit racing for triple the price! This is my first order and I am very happy, will order from again! I was very pleased with the way my order was handled. I will definitely use them again.